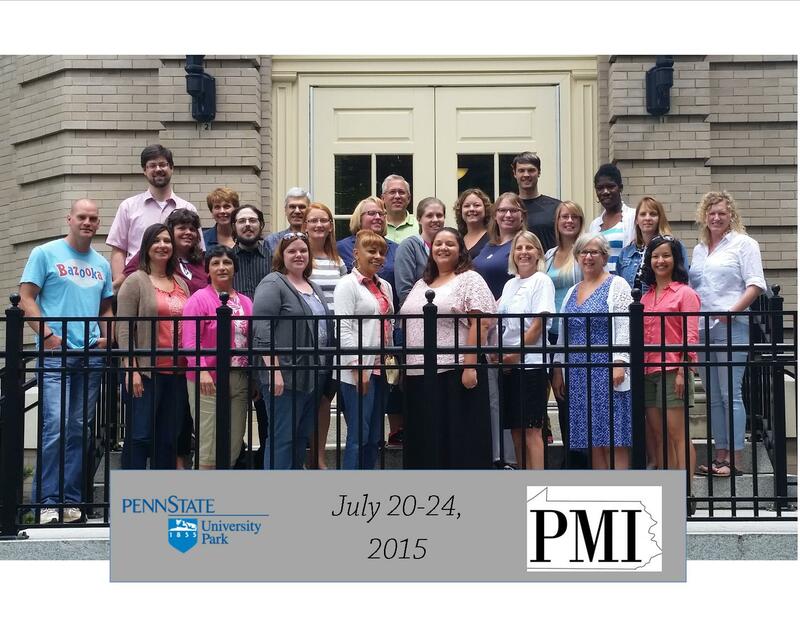 This has been an exciting summer for PMI! We offered the first (of what will be several) “second tier” workshop. This second tier of workshops is designed for participants who have completed Math as a Second Language and are looking for more professional development based in math content. July 6-7 we offered a two-day workshop on geometry, taught by Andrew Baxter and Shaun McMurtrie. Shaun is a former high school geometry teacher, the current K-12 Mathematics Coordinator at Bellefonte Area School District, and a 2014 PMI participant. We hosted 14 participants, spread across 8 districts, for valuable discussions on topics like the precision of language, the progression of geometry through K-5, dispelling common misconceptions, and a broadened perspective on how reflections, translations, and rotations fit into mathematics as a whole. We also offered the same week-long workshops as last year: Mathematics as a Second Language (MSL) ran July 20-24 and Functions and Algebra (FA) ran July 27-31. Andrew Baxter and Fran Arbaugh, who facilitated the workshops last year, were joined by Andrea McCloskey from the College of Education and an expert on math education in the elementary grades. We saw 20 participants for these workshops, spread out across 13 different Pennsylvania districts. These included some new districts, including Philadelphia, Big Spring, and Shippensburg. The paired post-test and pre-test comparisons showed statistically significant improvement on a test of mathematical content knowledge for teaching (for the second year in a row). The aggregate data for the past three years’ of participants showed statistically significant improvement for both mathematical content knowledge for teaching and a direct test of computation skills. We began our plans to expand these workshops to other Penn State campuses. Charles Helou and Marina Skyers of PSU Brandywine, and Beth Lindsey and Kuei-Nuan-Lin of PSU Greater Allegheny, each joined us during the workshops to see how they are run. The expectation is that similar workshops will run at these campuses as soon as the summer of 2016. We have won a $10,000 grant from the Whitaker Fund for Science and Math Education to bring teachers from Cumberland, Perry, and Dauphin counties to PMI workshops in 2016. We thank them for their support. We are preparing more proposals for funding from other sources, as well, as we expand our offerings. Andrew Baxter presented a contributed talk, “PMI: The first three years” at MathFest 2015 this August as part of a session on preparing elementary school teachers. PMI would like to thank its supporters: the Eberly College of Science, the College of Education, the Mathematics Department, and the Earth and Space Science Partnership. Without their help we would not have been able to do nearly so much this summer. Thanks also to Mandy Biddle and the rest of the Science U team for their logistical support.